Although it continues to be a male dominated field, women in jazz have long contributed as composers, songwriters, and bandleaders. While Ella, Sarah, Billie, Anita, and Carmen became so famous as singers they only needed their first names to be immediately identified; women have not achived that same level of recognition for their contribution as composers. Women, like Mary Lou Williams, Dorothy Fields, and Irene Higgenbotham. Lil Hardin Armstrong was more famous for her marriage to the great Louis Armstrong that her achievements as a jazz songwriter. 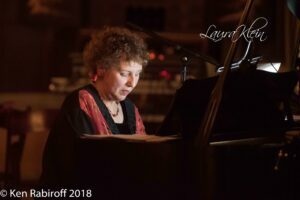 SJC proudly presents the Laura Klein Trio in their second SJC appearance on October 28, 2019, paying homage to “Women Jazz Composers.” With Kelly Faban Zasman on drums, Ruth Davies on bass, and Laura Klein on piano. Please join us.